This is based on a Sermon I gave Sunday 7th Oct. 2012, which I was asked to share! We all enjoy a good movie, don't we? When we were children maybe we dreamed of being the person in our favorite movie, perhaps the star. Maybe we imagined ourselves speaking the lines from time to time. Maybe you still do! On Children's Day 1976, at Belvedere, we watched "Man of La Mancha" starring Peter O'Toole as Don Quixote. You may remember the movie and the song "Impossible Dream". Later in his book about Rev. Moon Prof. Fredrick Sontag, compared Rev. Moon (True Father) to Don Quixote. 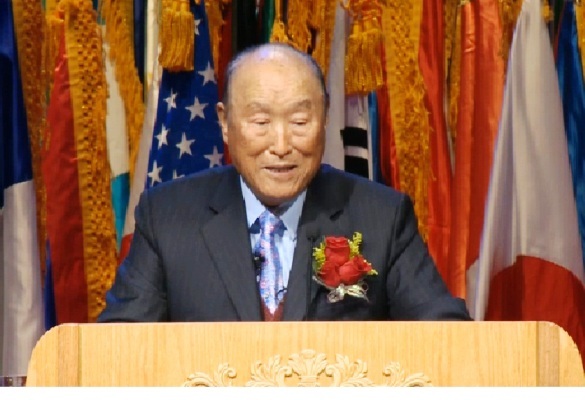 He said he felt that Rev Moon's vision was indeed an impossible dream. If we think of True Father, we might think of his favorite story or movie, or from where he drew inspiration. In the final years of his life he spent many hours in Hoon Dok Hae. Yes he studied his own life and words! Indeed if we were to try and make a movie of his life 2-3 hours could never be enough. A whole series of movies could never really be adequate to express such a life. In the future maybe many movies will be made to express The Legend that was his life. We all know that we have, and will continue to draw, massive inspiration for our own lives from his life. Indeed the example he gave to us in his life will undoubtedly continue to inspire people to live godly lives for many centuries to come. As with all great people True Father has many detractors and since his passing we have seen not only the old false accusations but also we may have heard or read people speaking about the True Family. In fact if we look at True Fathers life he has suffered not only the external persecution and violence that we are all familiar with but he has also suffered every imaginable wound to his heart that you can think of. Every family issue that affects people has touched his family in some way or another. Divorce, betrayal, disloyalty, drugs, infidelity, violence, misuse of money the deaths of his sons at a very young age, all of these things and more have wounded his heart. In many ways we could say there is nothing he has not gone through. But through all this he has not only kept his heart of Love and loyalty towards God but even continued to be a champion for Gods will. In doing this he has also kept a heart of love for his children – us as well as the True Children. I see this as a comfort and example to anybody going through any difficulty no matter how great or small. We can all learn from this example when dealing with our own issues in our life. From the above I have to think of 2 bible stories. Firstly Father reminds me of Job in the Old Testament. The story says Satan was going about the earth and God said to him "did you see my son Job? How much he loves me" but Satan says "he only loves you because you blessed him. If I were to do something to him he would curse you" So the story goes on as Satan strikes Job in different ways but still Job praises God even when his friends tell him he is a fool to do so. Father, as I said, not only praised God but sought to comfort God's Heart and be his champion in spite of everything that was thrown at him. Secondly I think of Jesus story of the Prodigal Son where in this case we might say that True Father is like the father in the story. Willing to take back, with Joy, the Son that left him for a hedonistic lifestyle. When he is ready the son will return and the Father has the True Heart of a parent to welcome that son back. We are each our Father's Prodigal sons in some way. Indeed if we are able to see it we may be more able to practice the Heart of the Father. And so it comes to Our Life Story! How can we become the Legends in our own lives? You have something unique to offer the world. We each need to learn to choose the way of Love in every moment of our life. Whatever has gone on in the past is the past. The future starts now! Tomorrow; The Week Ahead this is the Future it is not some distant place but we start our future right here, right now and we can choose to Live with and for God in a loving way, Loving God and Loving each other. The way that love is proved and tempered is not in the easy times but in the way we meet the difficulties. The way in which we overcome the difficulties is the test of our True Love, for God and for each other, especially in the relationship to those closest to you. As we come closer to God we find ourselves becoming closer to others! So whatever we choose to do we need to do wholeheartedly = with our whole heart = with a heart of True Love. We find our self choosing and living a life of true love. Then we become our own hero's, our own legend's as we follow the best example there is! "A wise person will place hope in the future and continue to move forward, no matter how difficult it may be. A foolish person, on the other hand, will throw away the future for the sake of immediate happiness."